Virginia Apgar, at left, developed her namesake test to evaluate a newborn’s health outside the womb. Nearly every newborn gets an assessment thanks to a physician named Virginia Apgar, who saw the need for better infant healthcare. It’s the first standardized test you ever took. While you probably don’t remember your score, infant survival worldwide has improved thanks to the Apgar test, a simple assessment of a newborn’s health taken at one and five minutes after birth. Invented in 1952, the test is still used today in hospitals worldwide. Most know APGAR as an acronym for the health components it measures: Appearance, Pulse, Grimace, Activity, and Respiration. 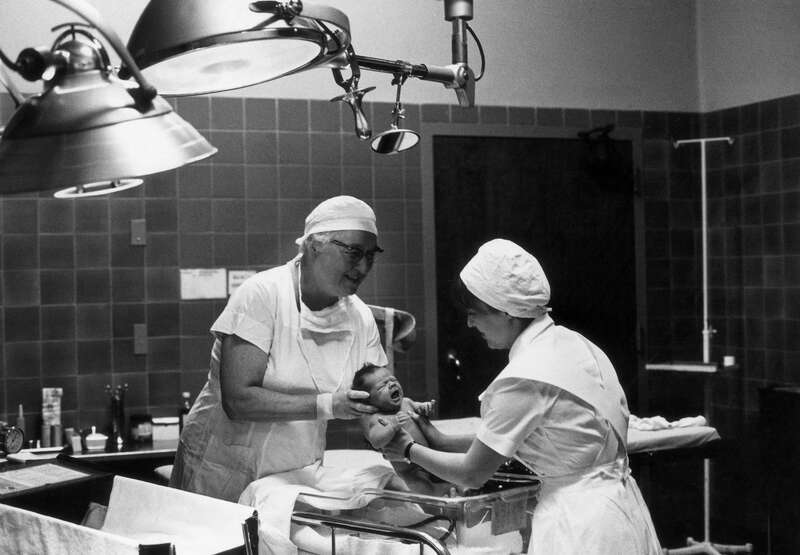 But it’s named for Virginia Apgar, a pioneering anesthesiologist. Apgar began her medical training as a surgeon, but a mentor discouraged her from pursuing the field because she was a woman. Instead, she switched to the then-nascent field of anesthesiology, focusing her research on how anesthesia affects mothers and babies. As late as the 1940s, delivery room staff paid more attention to the health of the mother and could do little to help an infant born with health issues. Yet Apgar saw that newborns lives could be saved if they were given medical attention immediately. When an intern asked her during a lunchroom conversation what she would do to evaluate a newborn’s health, Apgar quickly jotted down key health markers, which eventually became the framework of her namesake test. An infant is given a score of zero, one, or two on the set of five markers. The total score out of 10 lets doctors, nurses, and midwives know whether an infant might need emergency medical care, such as help with breathing or heart monitoring. Apgar showed that her test is connected to infant survival: Babies with the lowest score had a death rate of 14 percent; and those with the highest scores had a death rate of 0.13 percent. More than 60 years after the Apgar test was first developed, research shows that this quick and easy-to-teach scoring system remains a useful tool. In 2015, the American Academy of Pediatrics reaffirmed its relevance by stating that “the Apgar score provides an accepted and convenient method for reporting the status of the newborn infant immediately after birth and the response to resuscitation if needed.” Babies across the globe continue to have Virginia Apgar to thank for their first surprise exam.